Outstanding sporting talents were celebrated this week at the Macquarie University 2018 Blues Awards. 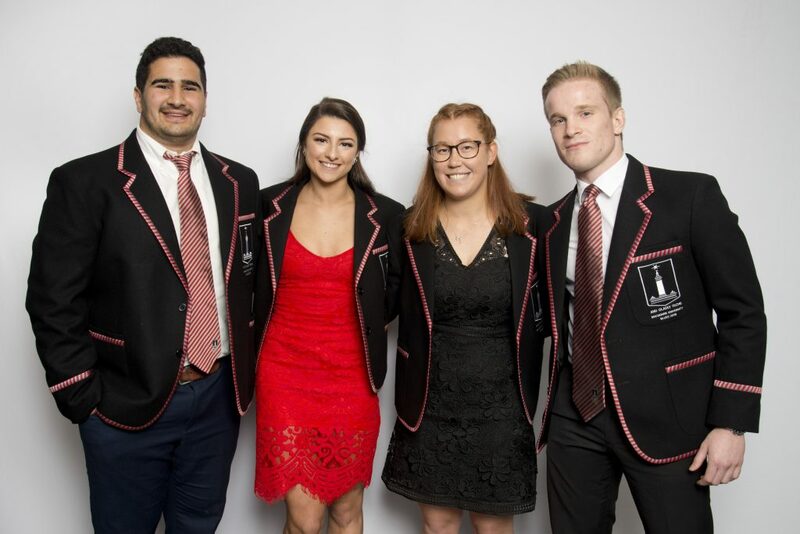 A number of athletes were recognised for their achievements athletically and academically while representing Macquarie, their state or nation over the past year. Former Olympic gold medallist Brooke Hanson OAM was the master of ceremonies, with Macquarie alumni and former award winners attending the evening to present awards. Acting CEO of Campus Life Peter Boyle said the annual Blues Awards are a wonderful opportunity to recognise outstanding sporting and academic achievements and celebrate all of the individuals who contribute to sport at Macquarie. “In 2018 our students continued to shine on the world stage, with multiple students representing Australia at World Cups, championships and other international events, while our University representative teams continued their dominance on home turf,” said Mr Boyle. Six athletes were awarded the highly prestigious Blue Award, with an incredible nineteen receiving a Half Blue Award. Five athletes, one club and one sport administrator received recognition with other major awards, including the Female and Male Sport Athlete of the Year. The Hon. Patricia Forsythe and retired NRL player Jason King were in attendance to present the coveted Chancellor’s Award, which was awarded to Dominique Du Toit for the second year in a row. Dominique has been part of the Australian Women’s Rugby Sevens team since 2016, winning silver at the Commonwealth Games and recently being crowned World Series Champions after a highly successful five leg series. 2018 also saw the introduction of two new awards: the Kim Guerin Leadership Award – in honour of Campus Life’s late director – which was presented to Elizabeth Clarkson, captain of the Softball team. The Softball team also won the second newly established award, the Nationals Team of the Year Award, for bringing home gold on the national stage. Ashleigh Blake, Lauren Gallaway, Chantelle Kerry, Kyle McIndoe, Michael Wells, and Rohan Zebib. Ella Beere, James Boyer, Lily Brazel, Adrian Brett, Mathew Buntine, Jessica Bunting, Josh Byron, Jenna Cooper, Tom Craig, Dominique Du Toit, Jaydn Field, Daniel Gartner, Tomas Gartner, Thomas Green, Toby Greene, Jacob Mccorry, Tess O’Connor, Cameron Pappas, Esther Qin. Dominique has been part of the Australian Women’s Rugby Sevens team since 2016, winning silver at the Commonwealth Games and recently being crowned World Series Champions after a highly successful five leg series. As a member of the Australian Diving Team, Esther completed a successful FINA Diving World Series campaign in 2018, winning silver in two events. She also partnered with Georgia Sheehan in the Commonwealth Games winning both a gold and bronze medal. Tom is a member of the Australian Men’s Hockey team, who have achieved the world number one ranking over the past twelve months. The team also secured gold at the Commonwealth Games, a Champions trophy and will compete at the World Cup in December this year. This award recognises high-level sport performance by a student in their first year of study at Macquarie University. Racing in the ITU World Triathlon Multisport championships, Jess qualified for the 2019 World Championships. Jess also finished first in the World Sprint Triathlon, qualifying for the World Sprint Triathlon Championships. 2018 saw the club’s most successful season on the field with all five of the Macquarie teams making finals. The club has continued their growth, securing long term sponsorship and partnerships with community youth clubs, in addition to establishing a Macquarie alumni masters team. One of Macquarie’s largest clubs with 150 members, the Table Tennis club has seen extraordinary success through both competition and club development. In 2018 the club recorded its most successful season with four players representing Australia at the Commonwealth Games. This award recognises long term volunteer service to a sport club, sport program or Unisport event, and was presented to Keelan Birch, president of the Squash club. Jaydn is an Indigenous sport scholar studying a Bachelor of Human Sciences. In 2018 he was selected to compete at the Oztag World Cup for the Indigenous Men’s Under 21’s team. He is also a contracted Parramatta Eels Under 20s team player. Honouring the late Kim Guerin, this award recognises a student leader who demonstrated outstanding leadership while representing Macquarie, leading with integrity, resilience and compassion while always striving to create a supportive and positive team culture. This year’s winner, Elizabeth Clarkson has been leading the softball team for the past three years and through her resilience, passion and dedication has led her team to back-to-back national titles while setting the benchmark for leadership amongst her peers. The Softball team had another dominating performance, going undefeated throughout the tournament and earning the title of back to back champions on the national stage.